If you think you have limited design options to make your gliding patio doors uniquely yours, think again. With all the customization options at your disposal, you can a door style that fits with the neighborhood while being arresting all on its own. First off, our sliding patio products come in many interior and exterior shades to enhance your architecture. Whether you want to make them blend or shine, you have the power to pick the perfect palette for your exterior doors. With the guidance of our experienced consultant, you can transform the look and feel of your home from inside out with just your sliding patio doors in St. Louis. We provide you an extensive selection of hardware styles and finishes to help you tailor your design to your taste. Feel free to run wild with your imagination and visualize countless combinations. At Renewal by Andersen of St. Louis, we know that creating visual harmony is paramount to tie your spaces together and lend your home a unifying look. For transitional fixtures like exterior doors, we want to help you choose the right pieces of hardware to match your existing design elements and have that sense of connection. Who said you could only enjoy a traditional home appeal from St. Louis French doors? We specialize in different grille patterns to add some Old World charm to your modern, gliding patio doors. Even if you live in a contemporary-style home, our grille options give you the flexibility to play with your home design and make your fixtures distinctively striking. Let’s design your sliding patio doors to perfection. 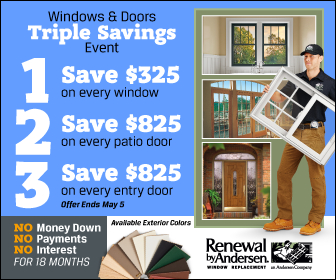 Call Renewal by Andersen of St. Louis now at (314) 332-2364 and schedule your free in-home consultation.